Some cars live for ever because they are constantly reinvented. The Scirocco, a pure-bred European sports car, is one of these cars that is forever young. Presented at the Geneva Motor Show in March 41 years ago, it became an icon of compact German coupés. The car caught the spirit of the age: over a million units of the Scirocco have been produced since then. Last summer a comprehensively refined generation of the sports car was launched, featuring, among other things, a completely new range of engines. Building on this, Volkswagen unveils the new Scirocco GTS - a sports car with 162 kW / 220 PS - in a world premiere at Auto Shanghai. Its engine is one of the most popular in the Scirocco range because it is sharing its design genes with the engine of the Golf GTI. A turbocharged direct-injection petrol engine that is recognised as being one of the most agile four-cylinder engines in the world. It catapults the Scirocco GTS - either with a manual gearbox or with the 6-speed DSG - to 100 km/h in just 6.5 seconds. Top speed: 246 km/h (DSG: 244 km/h). The average fuel consumption shows just how efficient the engine of the Scirocco is: just 6.1 l/100 km with a manual gearbox and similarly economical at 6.4 l/100 km with a DSG gearbox. There has been a Scirocco GTS before, in 1982, and that coupé was also related to the Golf GTI of its time, both technically and visually. The Scirocco was recognisable by a strikingly designed GTS stripe (which ran all round the silhouette of the car just above the sill), its distinctive sport seats and a gear knob in golf ball design. The GTI had the same sport seats (with different upholstery) and the golf ball gear knob. Today, the situation is similar. The new Scirocco GTS will be launched in Europe at the end of May, with China following in the summer. This marks the comeback of an icon, a straight-forward, mighty fast and exclusively-equipped sports car. The Scirocco GTS will be equipped as standard with new 18-inch "Norwich" alloy wheels; the popular 19-inch "Lugano" alloy wheels will be available as an option. The red brake callipers of the GTS can be seen through the spokes of both of these wheel options. In addition, the Scirocco GTS comes with the R-Line package "Exterieur" as standard, which includes distinctive R-style bumpers (at the front with integrated fog lamps and glossy black radiator and air inlet grilles), custom side sill extensions, a roof spoiler (also R-style) and a diffuser. The wing mirror caps are painted in stylish black and, just like its predecessor, the '82 Scirocco GTS, the new model can be ordered with a sporty GTS decal for the body as an option (standard in China). This option features two decorative red stripes that run centrally from the bonnet over the roof and the boot (if the car is painted in "Flash Red" the stripes are black). 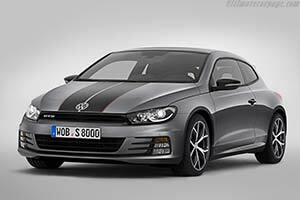 The new Scirocco is also enhanced by 3D GTS logos in the radiator grille and on the tailgate. The Scirocco GTS can be ordered in six colours: "Deep Black", "Indium Grey", "Urano Grey", "Pure White", "Oryx White" and, as already mentioned, "Flash Red". Air vents and inside door handles in "Black Piano Lacquer"
Also included as standard: The "Composition Colour" infotainment system, available for the first time in the Scirocco. This marks the debut of the second generation of the modular infotainment matrix (MIB II) in this series of sports cars. As an option, the Scirocco GTS can also be ordered with black "Vienna" leather upholstery; here again the seats are customised with decorative red seams. Volkswagen also offers features such as the transparent panoramic tilt sunroof, bi-xenon headlights, a multifunction steering wheel and - as previously mentioned - the new MIB II radio navigation systems. In China the leather interior and the panoramic tilt sunroof come as standard.